A descriptive essay is probably one of the shortest essays a student faces since it is not longer than 1 page. This is the paper where you are supposed to, first, describe and then sum up the topic you are working on. You don’t have to add other people’s opinions, just your personal thoughts on the issue. But, even if it doesn’t demand a lot of efforts and time, you still have to have certain skills to manage a good essay. 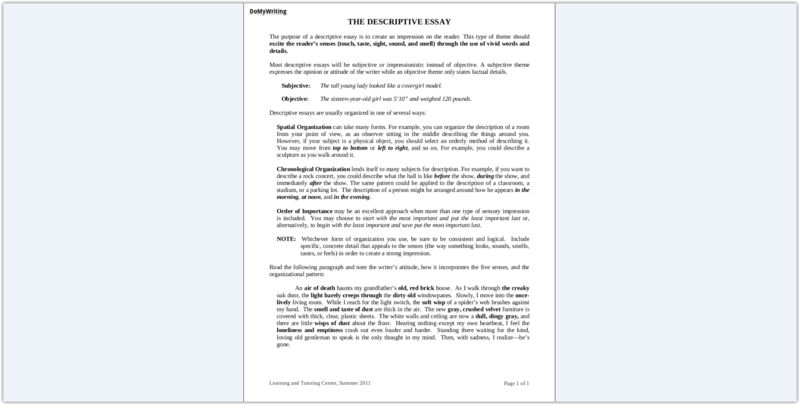 You do not need to add analyzes, quotes, statements or evidences to your descriptive essay. You just put the description of your feelings related to the described topic. Let’s say your task is to describe a painting. You need to explain with words what you see in canvas and your impression. Human. If your task is to describe a human it means you need to speak about appearance, character, actions and individual features of the person. Place. If you decide you write a descriptive essay about a place, make sure the object of your paper is a popular destination which causes a lot of emotions. This is what will help you making your paper a winning one. Event. Here you can describe any interesting event you have personally experienced, read or heard of, or dreamt of visiting. Include details such as dates, place, goal, activities and the result of the event. Animal. Working on this type of essay you can write about any animal, wild or domestic, real or mythical, your pet or the one you like most of all. Occupation. This type of paper gives you full freedom to speak about the job you are planning to have in the future. Behavior. People’s behavior is a very interesting theme to talk about. You may select to describe typical behavior of people of different age or status, your family member or a friend. Or you may go deeper and speak of a psychological aspect of behavior, for example how people act under different circumstances. You need to keep your essay plain yet official. And do not forget about the option of having your essay composed by expert writers. 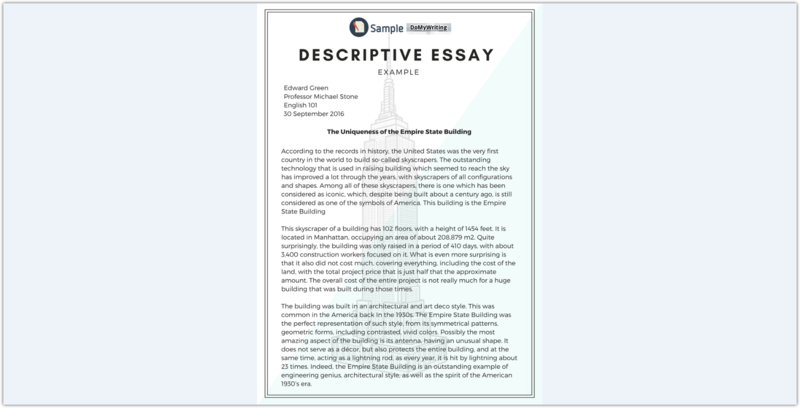 Below you will find one hundred sample topics for A-level descriptive essays. Keep in mind these are just examples, and you are absolutely free to suggest your own topic. It would be better if your assay has one object. Devote it to one main thing you want to describe. Due to this, your paper will be focused and clear. In a descriptive essay you should use a lot of descriptive words that complete the picture you will be presenting. Compose a detailed description of the person you know. Compose a detailed description of the person you think should be an example for everyone. This can be your family member, friend or a celebrity. Think of your favorite TV show or movie and describe your favorite character. Why should we respect M.L. King? Why do you consider Abraham Lincoln one of the brightest presidents of the US? Make a list of the qualities of someone you date/going to get married and explain why are these qualities so important for you. Name the qualities you value in your friends. Whose personality you like more Wonder Woman or Xena? Describe one of bad characters, real or invented, and describe them. Explain which features make your favorite actor stand along others. Describe the personality of your favorite teacher/professor. What made John Kennedy one of the most prominent politicians in the US history? Explain the actions someone would do in certain circumstances. Did you have any psychological events that influenced your behavior? Describe someone you don’t like. Describe one of the movies you watched recently. Is there any character of horror movies you would never want to meet in real life? What would you do if you meet your idol in a café one day? Which features, to your mind, should best friend have? People with which traits may become your enemies? Do you think relationship in couple can last forever? Describe someone you admire of who achieved a lot in business. How do you picture an ideal fashion model? Why is your mom different from others? Which traits in your father make him the kindest of dads? Describe the place o your residence. Is there anything you want to change about it? Would you prefer staying at the same place or move to another? What s your favorite location for winter holiday? Which place would you chose for your next winter vacation? Describe your perfect places for vacation in summer. Are there any ways students can make their dormitories a better place for living? Describe 5 locations you love in your country. Where would you like to have your wedding ceremony? Where do the stars shine the brightest? What would be your perfect place for a huge rock party? What are the top 10 locations you are planning to visit one day? Describe your home town and what you like about it. How come they call Melbourne the heart of the country without it being the capital? What was the noisiest place you have ever visited? What is your world’s best place? Describe 3 best placed you have even visited with your family. What was the most beautiful garden you have ever been to? If you were to choose where would you hold a summer music festival? What are the famous world’s 7 wonders? What would you call the 8th world wonder? What are your emotions when you visit the places from your childhood? Why would you prefer living in your homeland than migrating somewhere else? Describe your rout to your favorite location. If you were to choose where would you hold a students’ party? What do you think is the best invented place? Use various descriptive methods to speak about your wonderful life. What did you enjoy most of all during your last seaside vocation? Do you remember you first celebrated your bet fried’s birthday? How would you picture the map of your mind? Describe your emotions in your first day at school/university. What was your worse life experience so far? What are your best memories about a close person who passed away? What is your best activity when you visit your grandparents? What is your best episode in your life as a student? Do you remember your first love and emotions you had? Describe how your favorite activity helped you change your visions of life. What do you think kids learn quickest? Describe your emotions when in the mountains. What do you enjoy about riding a bicycle? What was our last trip abroad? How do you feel being an exchange student? How do you feel when taking English language examination? Was there anything in your life that made you feel really afraid? What was the thing that made you laugh like crazy? What would you recommend to do when in London? Do you have your favorite place in the forest where you feel relaxed and at ease? Do you remember your emotions when you first saw snow? Do you think keeping a diary is something important? Do you remember your party to celebrate your 10th birthday? What do you feel when at funeral? Compose several paragraphs to describe your family relict. Do you think there is a thing, like a talisman or totem, that is able to save our life or life of you close people? What do you know about the Silk Road? Were you ever in a situation that you wanted something so much but you didn’t have money to buy it, so you were thinking of stealing it? Do you know what the painting that cost the biggest was? We all use modern technologies in our lives. Select one and describe it. Explain why it is important for you. How would you describe distance and time you need to cover to get to your favorite location? What do you like most of all in ancient cultures (Egypt, Greece, Rome)? Do you have any icons at home? What are they and what is their purpose? Describe one of the greatest constructions in the world. How important is Indian Taj Mahal in the history? How do the solar system and its plants work? How important is the Bible for believers? Is the quality of sleeping depends on the quality of bed? Do the clothes you wear speak for your personality? What is so cute about soft toys that we adore them? What should you put in your luggage when you go for a sea cruise? How does money influence our life? Is the market price of vegetables fair? Why do you still keep your Tamagotchi toy? Do you think you are dependent on video games? What are the features you like about your old doll? Provide a detailed description of your room. Provide a detailed description of your neighbors’ house. Structure helps students in the process of writing since it makes thing clearer. You certainly know what you will write next. However, when you deal with a descriptive essay, you do not need to stick to the same structure for each type. If your task is to compose a paper about person or object you don’t have to stick to structure. But if you are composing an essay about location, object or event you should follow the structure. 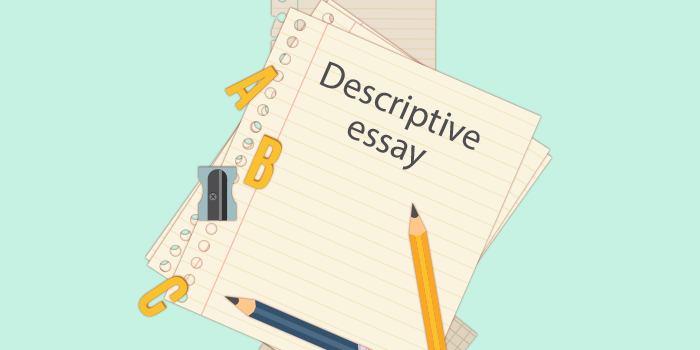 And, there is one common feature about all types of descriptive essays – no need to gather and analyze materials, no need to add quotes or make statements. In this essay you only express your personal attitude, feelings, and emotions about the subject. For an excellent essay here is what you have to do. Take a sheet of paper and draw 5 columns. Each column will correspond to one human feeling: taste, touch, smell, sound and sight. 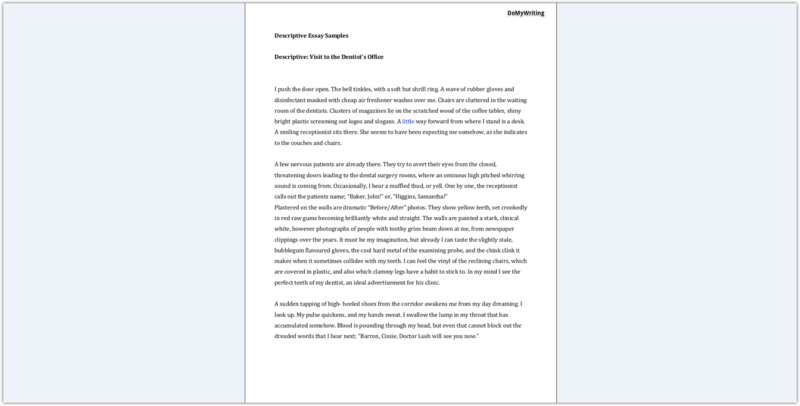 Each essay should contain description of these 5 senses in relation to the subject if the essay. You will realize that some senses are better expressed in one situation, and others – in others. It is also important to make a plan of your future essay. Plan is your guide when composing the contents of your paper. Normally, a descriptive essay should consist of 5 paragraphs each of which is used to cover one specific issue. First paragraph is for introduction, then 3 body paragraphs and conclusion. There is no list of material sources since you are supposed to provide your personal impression. Such essays are aimed to develop imagination. If you let your imagination completely free the size of your essay will grow. If you have a good imagination or you are able to express your feelings clearly this is your type of written assignments. Pre-writing preparation. If you have a good idea of the object you are going to describe this is a very good beginning. If you need additional material look for it only in trusted sources. After reading additional info focus on your personal experience, your feelings and emotions, your memories. Accumulate all your senses and compose a plan. What to begin with? If you manage to attract your audience attention in the very beginning, they will be yours until the last word. For a brilliant beginning start with an interesting story, fact, joke or personal story. Draft. Draft is the first, unchecked version of your future essay. You may write down everything that comes up to your mind. Do not worry about the length of the paper. You will be able to correct mistakes or make sentences shorter when you proofread your essay later. Focus on expressing your emotions, presenting a picture of the essay object using your words. Drawing images with words is a feature of skillful writers. Improve your essay language. When you proofread your paper you may consider it appropriate to replace some words with more sophisticated ones or paraphrase some pieces to make them sound better. Use dictionary to find a proper words or check the meaning. 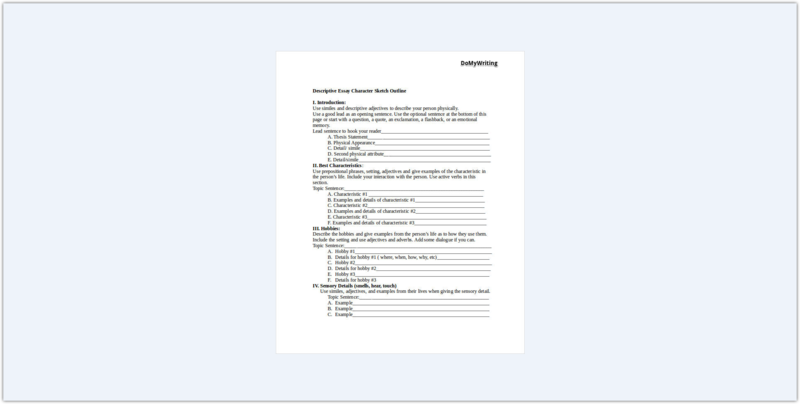 Try to keep your essay in light style without complicated expressions. Adjective is a part of speech that should be widely used in this type of essay. Proofread and edit your essay. It is a very important stage. Our teacher will not like grammatical, spelling or punctuation errors in the text. If you are unable to identify errors yourself, use one of free online programs. Then check if the text corresponds to the plan you have written, if the structure is correct. Check if the sentences and paragraphs are located correctly. What does revision consist of? Did you use all the methods and put enough details in the text to help your audience understand the subject? Check everything till the smallest detail. Did you use words that help you render your feelings, emotions, senses, sounds and touch, clearly? Are there parts that you feel like removing from the text? Do you write about the object of your essay in its every part? Are all parts of the text linked to each other in sense? Doing it beforehand will let you correct your mistakes and make your essay perfect. In nowadays world students, of both college and university, have a lot of written tasks. Sometimes the tasks are rather difficult, or students do not have time to cope with all assignments in time. The team of expert freelance writers is ready to assist you with your writing tasks every day of the week and in any time of the day comfortable for you. We will prepare and A-level academic writing of any complexity. High School College University Master's Ph.D.
Get A Great PAper Right Now!